Total wellness. The healing and strengthening of mind, body, and spirit through an active and encouraging community. This is the goal of the Healthy Active Natives [HANs] movement. This group has created a place for all Indigenous/Native people to come together in health and wellness, not just physically, but emotionally and spiritually as well. Founded and created by Waylon Pahona as a Facebook group in 2012, HANs has grown tremendously over the last five and a half years, now numbering more than 75,000 members. "HANs has come across so many inspiring people who have changed their lives through wellness; some have made changes with diet, [others] with mental, spiritual and physical wellness. It has been an amazing experience which has left me with wanting to document and share their stories of the struggles that they have overcome in their journey. 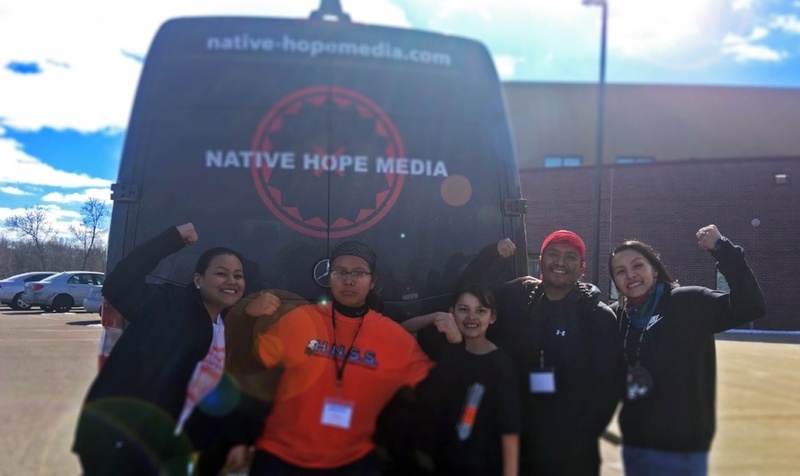 Thanks to the Native Hope Fellowship, we will be visiting and documenting departments and people who are doing great things to make an impact on reservations across the US." The HANs Tour kicked off with a journey from Albuquerque, New Mexico to the Ho-Chunk House of Wellness in Baraboo, Wisconsin. The trip included snowball fights, visits to Native youth centers, and culminated in speeches and activities hosted by the Ho-Chunk Nation. The journey continued as Waylon and the Native Hope Media team headed to Mesquakie, Iowa to visit with Dirk Whitebreast of the Mesquakie tribe, a marathon athlete and and suicide prevention awareness advocate. From there, they traveled to Chamberlain, South Dakota to visit and speak to the youth at Lower Brule High School and St. Joseph's Indian School. The HANs Tour is a celebration of unity, of wellness, of empowerment, and of hope. Old and young, Native and non-Native, working together to dismantle barriers, bring healing, and inspire hopeful change. Native Hope is thrilled to support impactful Native leaders like Waylon as he lifts up the next generation through stories, example, and fellowship. Interested in staying updated on Waylon’s work with Native Hope? Subscribe today and stay connected to this community of strong warriors.